Unlock the full potential of your USB-C compatible MacBook or PC with the Apollo 11-in-1 USB-C stand & hub. 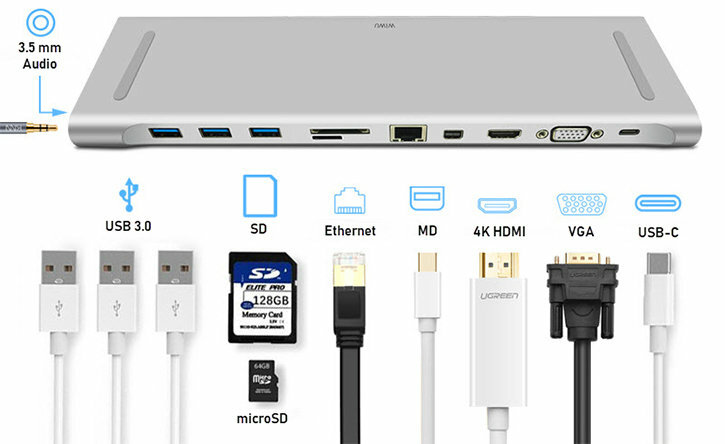 Adding 11 extra ports to your computer including HDMI, USB, VGA and much more and acting as a laptop stand - this hub has everything you need. 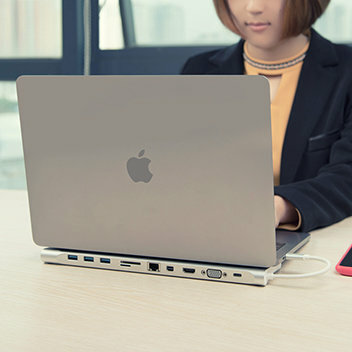 You might have already noticed that with each new generation of laptop or MacBook, there is usually one feature or port on the actual device that gets discontinued. This can be very frustrating and expensive for some, as it means your brand new shiny device loses compatibility with your already-owned accessories, such as monitors or peripherals. 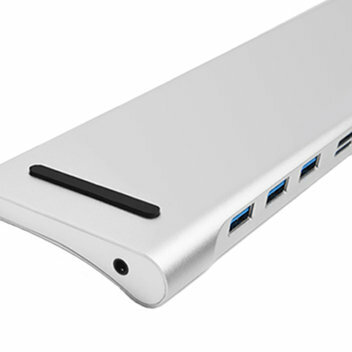 The Apollo USB-C hub and stand has been specifically designed to be compatible with both MacBook and PC laptop devices which come with a USB-C port. With a compact 11-in-1 design, the Apollo 11-in-1 hub adds various extra ports, meaning you will not have to constantly carry around or store multiple adapters to stay productive. As USB-C devices are becoming increasingly popular, the Apollo hub features a USB-C port meaning you'll be able to connect and charge any of your other USB-C devices including smartphones or any other devices which feature a USB-C port. Add 3 ultra-fast USB 3.0 ports to your computer and connect a wide range of media devices, which include USB memory sticks, external USB hard drives, printers and other equipment. The latest USB generation ports will ensure ultra-fast data transfer speeds of up to 5Gb/s. The Apollo hub and stand features a HDMI video output which supports 1080p@60Hz or up to 4K@30Hz video output, meaning you'll be able to connect your MacBook or USB-C compatible laptop to an external display. Producing a crystal clear image, the Apollo hub is perfect for mirroring your device onto a big screen to show a presentation in a work meeting or just to kick back and watch a movie in beautiful 4K. Along with the HDMI output, the Apollo hub and stand features a Mini DisplayPort video output which also delivers 1080p @ 60Hz or up to 4K @ 30Hz video outputs, thus resulting in a greater compatibility with your existing monitors and projectors. If none of the video outputs mentioned above work for you, the Apollo 11-in-1 hub goes above and beyond to ensure you have at least one video output that is compatible with older devices. The included VGA port will allow you to connect to older TVs and monitors with a maximum output resolution of 1080p. With the integrated video outputs mentioned above, the Apollo hub and stand gives you the opportunity to not only mirror your display onto a larger screen, but to also extend your MacBook or PC display so that you can work more efficiently or have a more immersive gaming experience with multiple displays running at the same time. Additionally, this Apollo Hub features SD and microSD card reader slots for transferring data from devices such as games consoles or cameras to your MacBook or laptop, making this adapter perfect for photographers. A wired internet connection is often a faster and much more stable option to connect to the internet or to a local network than a wireless internet connection (Wi-Fi). This Apollo hub and stand features a dedicated 1 Gigabit Ethernet female port, which allows you to connect to your wired internet connection at home or work. Enhance your audio with the integrated 3.5mm audio port. 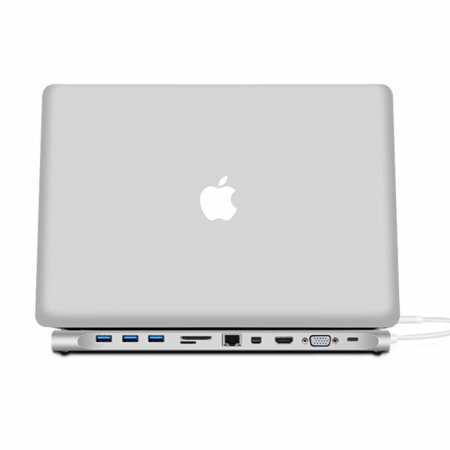 As a conventional audio port, you can use your compatible wired headphones or speakers with your MacBook or PC for better sound and a more immersive experience. 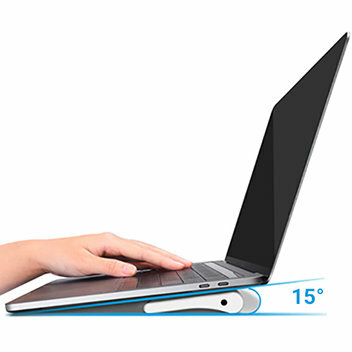 The Apollo hub and stand also acts as a laptop stand, so that you can conveniently rest your MacBook or laptop at the perfect angle of 15 degrees to improve usability and comfort. 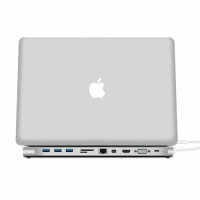 Including anti-slip feet, the Apollo hub will hold your MacBook or laptop securely in place. With its lightweight and compact design, the Apollo Hub is perfect for carrying around in your bag, without adding any unnecessary bulk. The Apollo 11-in-1 hub has been crafted from CNC precision milled aluminium, allowing it to connect and blend in perfectly with your stunning new MacBook - this stylish hub will not look out of place, when in use. 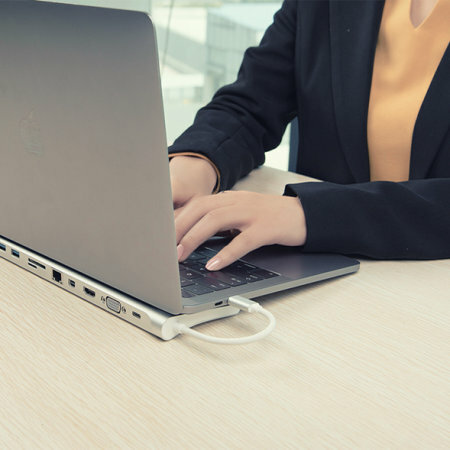 As the Apollo hub makes use of the increasingly popular USB-C port, you'll be able to use it with your favourite USB-C compatible laptops such as Macbooks, Macbook Pros and other Windows laptops. *Please note orders for batteries and power banks may be subject to delays due to dangerous goods shipping requirements. A low cost, reliable international posting service, suitable for your less urgent orders. This service is untracked and is usually delivered within 4-8 working days, or up to 20 working days (depending on location). Order before 6pm UK time for a fast, secure and reliable worldwide delivery. Your item will receive priority handling, and benefit from a full on-line tracking facility so you can check your mail’s progress along the way. Usually takes 1-3 working days. One flat delivery price for your order, no matter how many items you buy. For partially in-stock orders you pay for delivery only once. We’ll ship what’s in stock now and the rest later at no extra charge. You can view all of our delivery options, covering UK and international shipping by visiting our Delivery Information page. Buy with confidence. Our 30 Day Money Back Guarantee means you can return your item in exchange for a full refund or exchange. For more information about Shipping, Handling and Returns, please see our Terms & Conditions.